After days of discord, South East Asian nations have released a watered down joint statement on the disputed South China Sea that avoids rebuking China. The Philippines had pushed for the 10-member Asean group to mention an international tribunal's recent rejection of China's claims in the sea. But Chinese ally Cambodia had blocked such a move, in what is seen as a diplomatic victory for China. One Southeast Asian diplomat told AFP a "compromise" had been reached. The statement says Asean remains "seriously concerned" over recent developments in the sea "which have eroded trust and confidence". It does not mention China directly. What is the point of Asean? 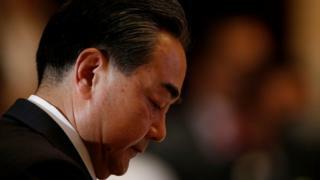 Asean foreign ministers were meeting for the first time since the ruling on 12 July by the Permanent Court of Arbitration, which found there was no evidence that China had historically exercised exclusive control over the waters or resources in a case brought by the Philippines. China, which claims almost all of the South China Sea, including reefs and islands also claimed by others, called the ruling "ill-founded" and said it would not be bound by it. US Secretary of State John Kerry and Chinese Foreign Minister Wang Yi are also in Laos for regional meetings. Over the weekend it had been feared that Asean ministers would fail to issue a joint statement for just the second time in the grouping's history. The last time was in 2012, and also stemmed from Cambodian opposition to language used about the territorial dispute. Mr Wang had earlier praised Cambodia's support for China's stance, Xinhua news agency reported. Beijing has in recent years provided generous aid packages and loans to Cambodia, one of the region's poorest countries. Asean (the Association of South-East Asian Nations) is made up of Indonesia, Malaysia, the Philippines, Singapore, Thailand, Brunei, Cambodia, Laos, Myanmar and Vietnam. Along with the Philippines, Vietnam, Malaysia and Brunei also have claims on the South China Sea, as does non-Asean Taiwan. Video Island, rock or reef? Why is the sea so contentious?